Bananas cost a lot of money at the moment so they are not ending up in the shopping trolley of most families. My hubby Joe, is an avid gardener, so we are very fortunate to have Lady Finger and Cavendish bananas growing in our back yard. We share the bananas with our neighbours, family and friends. The taste of homegrown untampered with bananas is fantastic. Now, despite sharing them out, we still get left with quite a few bananas so I have had to think of a few ways to use them. I make banana bread and I use bananas in muffins and a host of other recipes. I also put whole unpeeled bananas in the freezer and use them for smoothies when I need them - peeling them first of course! Bananas are a real health food. 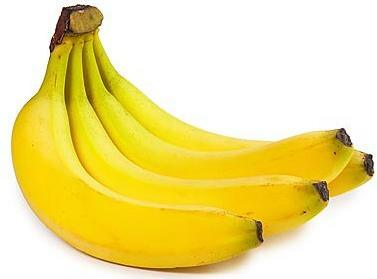 They contain around 100 calories per banana as well as protein, fat, carbohydrates, calcium, phosphorus, iron, Vitamin A, Vitamin B, Vitamin C and water. Great for pregnant women as they also contain folic acid. Beside eating bananas, they can be used for a lot of other things as well. With the price they are, why not get the most use out of a banana? You can use them to replace a lot of unhealthy options for household cleaners and personal care and save money on your household budget as well. Remove surface scratches on CDs - gently rub the surface of the CD in a circular motion with the inside of a banana peel. Buff with a soft cloth. Done! Pesky itchy mosquito bites bothering you? Rub the bites with the inside of the banana peel for instant relief. Need to have those leather shoes shining like new? Wipe the inside of the banana peel over the shoe surface. Leave for a minute then buff off with a soft cloth or brush. Clean your indoor plants by rubbing the inside of the banana peel over the surface of the leaves. Not only will the dust be removed but the leaves will look shiny and healthy. Time to polish your wooden furniture? Use the inside of the trusty banana peel once again. Apply as you would polish rubbing the surface in circular motions and then buff to a lovely sheen with a soft cloth. Don't throw the peels away. Put them in your compost pile to add some magnesium, phosphates, sodium, sulfur and calcium to the soil. Fruit trees and flowering plants love compost made from banana peels. I hope I have given you a few reasons to go bananas over bananas! Feel free to share some of the ways you use them too. Congratulations on your healthy lifestyle Blog. Love all your practical home-style tips too. Thanks Karen. Glad you enjoy them. I didn't know a banana could do all that! Especially about removing scratches from a cd. I also love to sue banana on my face. It's incredibly anti-aging and great for wrinkles! The other thing with banana peel is to chop it and feed your elk or stag horns with it... ferns love it too! I am blown away by the CD challenge however! Glad you enjoyed the information :) Thanks for the extra tips Robin and Char. I also polish my leather lounge with banana peels.